Suziqu's Threadworks: Teaching my First Online Class and Journal pages - "The Dream of Dance"
Teaching my First Online Class and Journal pages - "The Dream of Dance"
and one of the inside pages. direct link so you may enrol then. my newly completed Journal - "The Dream of Dance"
to take these photos for you! to make that dream come true. experiencing the splendor of it all! Now I hope this journal brings a little inspiration to your heart. to create one of your own books too. I trust there will be more coming. Oh My Goodness...there is so much beauty I don't know where to begin. Congrats on the online class, how exciting!!! Your ballerina fabric book is simply amazing. This is so exciting!! I hope I will be able to participate. Congratulations on the class you'll be teaching. It sounds wonderful. This latest journal is beautiful! Beautiful... You are so talented!!! YAY YAY YAY finally, I am thrilled to bits that we will be able to see you in action and learn from you directly. I am so excited about it. 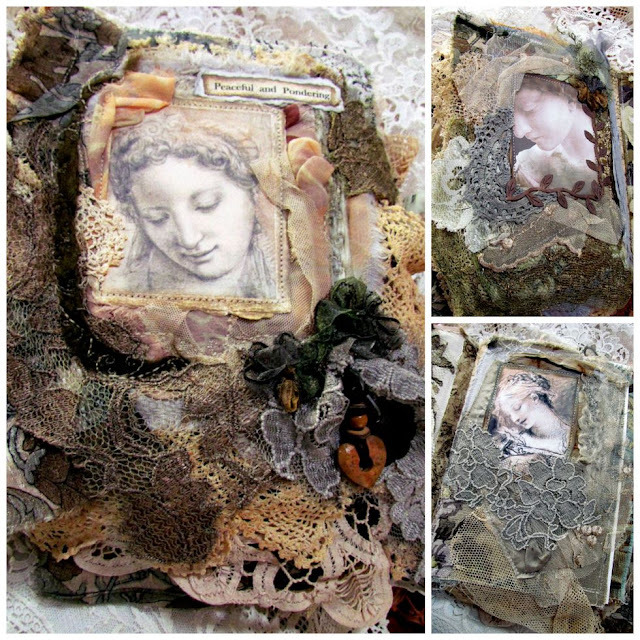 Your new lace journal is so exquisite, it is such a delightful theme and of course so beautifully done. Just like the previous comments on this post, I am so happy that I will be able to take an online class with you and learn your style of creating. This is a wonderful milestone for you! Congratulations. This book is so delightful and gorgeous. I know the new owner will enjoy it immensely. If I had purchased it, I know I would enjoy it. I so look forward to learning from you. Yea, all the laces I've been saving ready to use in a handmade book. Yippee!!! Oh dearest Suzy, congratulations my friend, I know you have worked so hard on this ,and I`m so happy for you, that your online-class, will soon be opened, what you show from the journal/ book you are teaching loooks divine, and so beautiful. Also your book of dance, is a dream, a wonderful story, and so many extraordinaire fabrics and laces in there and most beautiful images, too. So much lovelyness is always here, in front of my eyes, sweetie. Dear Suzy, Congrats on your online class. It will be an amazing journey and I wish for you great success with the fun process. Love your journal and I can see why it has already gone to a home to be enjoyed. The pages are lovely and the story so charming. Every detail is stunning. You are the designer of amazing talent. Thanks for sharing and blessings for a nice weekend. I have been waiting for this to happen and am so happy to finally see it come to life. Will be waiting for Sept. Such a gorgeous journal! Your work never fails to inspire me! I am so happy you are doing an online class. I can hardly wait to sign up. WOw, Suzy, I love the story created in this beautifull journal. I want to congratulate you on your new venture with the online tutor classes, I will keep my eyes peeled on the classes. Both books are beautiful! Congratulations on your online class, also - wonderful news! Oh, I'm so exited for you, my dear Suzy! Your new journal is simply gorgeous- love it. How wonderful Suzy! Congratulations! I'm going to have to look into your class.